A Youtube video of Fox News host Tucker Carlson's show. 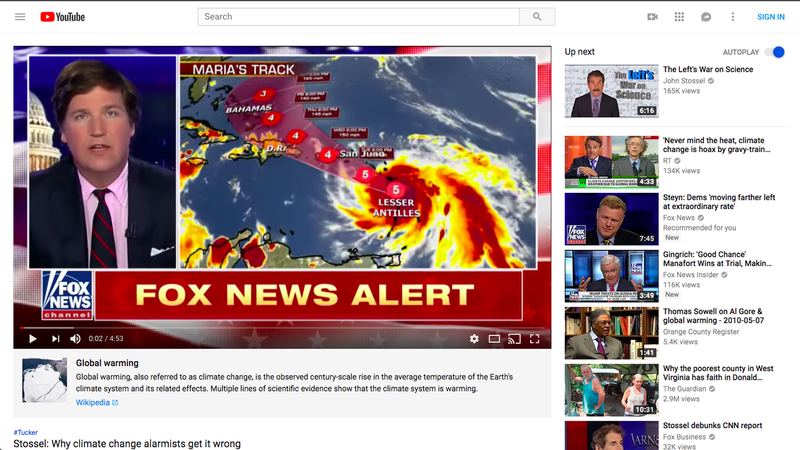 Viewers who click on YouTube videos about climate change, climate science and global warming may now see a small pop-up at the bottom of their videos providing facts on the issue at hand, as reported by Zahra Hirji at Buzzfeed News. Why it matters: YouTube does not make the full list of conspiracies that it wishes to mediate with third-party information publicly available, but Buzzfeed News' reporting shows that climate-related hoaxes are part of that set. Climate hoax videos aren't the only target. Disclaimers have also been found on videos published by RT, a Russian television network funded by the Russian government. The messages will also accompany videos on Dulce Base, Lilla Satsjöbadsavtalet, the 1980 Camarate air crash, the Federal Emergency Management Agency, the Kecksburg UFO incident, and the MMR vaccine. The big picture: Many social media platforms, like YouTube and Facebook in particular, have been criticized for creating news echo-chambers for consumers. For example, if a viewer were to watch a video challenging the broadly-accepted scientific consensus on climate change, they would be presented with more videos of a similar vein, with no guarantee of an encounter with accurate scientific material. In an effort to get around this problem, while also avoiding making editorial judgement calls to censor some of the content on their platforms, several companies are opting to give users more context around certain topics so they can broaden their perspective. Still, the efficacy of these efforts, which will be measured in part by clicks on the disclaimers, remains to be seen. YouTube CEO Susan Wojcicki announced in March that the site would begin displaying facts from Wikipedia and other third-party sources alongside controversial or hoax videos that challenge widely accepted facts, like the moon landing, details on school shootings, and now climate change. Facebook has a similar fact-checking partnership with Wikipedia and other organizations. The system isn't perfect, and YouTube and other platforms are still working to refine the effort. Buzzfeed News reports that the disclaimers also appear below videos that propagate accurate scientific information about climate change. Similarly, a time lag exists between the time a Wikipedia page is updated and when the change appears in the pop-ups. What's next? YouTube seems to have chosen to use Wikipedia's material without consulting them first, but the two are forging ahead with the experimental partnership nonetheless, according to Engadget. Editor's note: the photo caption has been corrected to remove a reference to Stossel's statements about climate change.